Home Bride Bride Speeches – Here Speaks the Bride! Bride Speeches – Here Speaks the Bride! So it’s one of the biggest days of your life; the grand, once in a lifetime occasion that will mark the milestone of your eternal union to the man of your dreams. This will be a day of warm sentimentality, sweet memories, eloquent words, beautiful clothing and surroundings, and good times shared by friends and family members. This is the day when people will honor you as the princess of the occasion, watching in awe as a vision in pure lace and sweet ivory silk floats down the aisle, joining her prince to declare their love in a lush setting of ebullient florals and mahogany altars, stained glass windows and satiny ribbons. It is also a day of sheer, unyielding panic; perhaps the most stressful and eventful day of your life, a day in which you—the lucky bride—will stand in the spotlight. 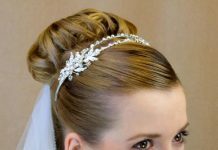 You no doubt will feel incredible pressure to look your best, be your sweetest and most cordial under the most stressful conditions, and make sure that all of your extensively and exhaustively made plans come to fruition in regards to your refreshments, your decorations, your reception and your honeymoon plans, and of course the ceremony itself. And at the reception itself, while most of your lucky guests will be able to kick back and wolf down on some mighty scrumptious cake (not to mention guzzle down shameful amounts of champagne), you on the other hand will face some of your most substantial challenges and cemented matrimonial duties. You will have to pose for photos, maintaining that bridal smile even as that white satin mummification device known as a bridal gown continues to confine and smother you (and don’t even get us started about those ultra-tight ballerina’s shoes, are ya hear in’ us ladies?). You will have to cut the cake and throw the bouquet, both with uncommon finesse and awesome bridal style. You will have to dance, and well (of course, chances are that your husband to be is dreading this part far more than you are). And, last but definitely not least, you will have to give a speech. Like it or not, bride speeches are among the most expected and anticipated components of just about any wedding ceremony. Your friends and family members will greatly look forward to hearing the verbal articulation of the great joy that you feel on this day. Furthermore they want to know where you and your groom are going from here; those sound and divine plans that will stand to shape your future. This is why they will listen to your bride wedding speech with a great deal of attentiveness; and perhaps even scrutiny. Sure, you could just wing it and speak from your heart; saying whatever comes to mind when the time comes, hoping that your words will come out in a well-phrased and articulate format. Before you take this route, however, stop to reflect back on some other important oratories that have marked defining moments in your life. When you were faced with the prospect of delivering your first big class presentation in school, your first project presentation at work, or perhaps a speech that you had to deliver in conjunction with your participation in a private function or charity event, did you even remotely consider the possibility of walking in unprepared; of simply saying whatever comes to mind without writing and rehearsing an oratory beforehand? Of course not; no doubt that you approached all of these speeches with a serious attitude and a certain level and strategy of deliberate preplanning. So why on earth would you plan the biggest and most important oratory of your life with a more casual or—dare we say it—haphazard approach? The conscientious bride should map out her bride speech with the same degree of care and seriousness with which she chooses her bridal gown, her ceremonial decorations, etc. And the first step in crafting the perfect bride’s speech is to determine what thoughts and emotions that you would like to convey to a listening audience of friends and family members who are sure to hang on your every word. How do you feel as you approach this, the biggest and most momentous day of your life? What do you think of this major life transition, and of the man with whom you are making ‘the big splash?’ How do you feel toward the other special people who stand beside you at the altar—your maid of honor, your bridesmaids, your flower girl, your officiating pastor, etc.—as well as others who have gathered today to witness the spectacle of your wedding? These of course probably will include your and your husband’s parents and siblings, your grandparents, cousins, and closest friends.What special feelings do you share with your new husband, and what exactly has brought the two of you together on this romantic journey of a lifetime? And what plans do the two of you have for the future? Once you come up with the answers to these all important questions that people will have when they sit down to hear your speech, you must decide how to format and organize them in the most efficient and free flowing manner possible. 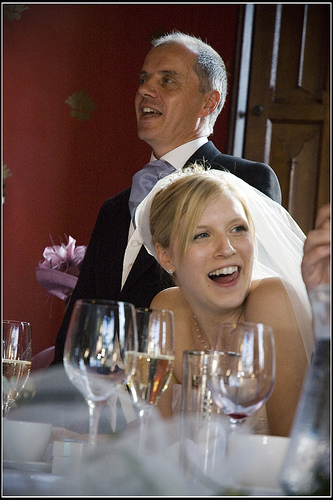 So first take a look at some top quality bride speech examples. True, no mere example can serve to dictate and convey the incredibly intense emotions that you are bound to feel on this most momentous occasion. The words that you express as a part of this once in a lifetime speech will be your own; what a good example will do is help you organize your thoughts and ideas in the form of a cohesive whole. A solid speech example is not a script that will serve to dictate every word that comes out of your mouth; quite the contrary, it is simply an outline that will serve to determine when and at what point you should deliver that stirring introduction (probably somewhere near the beginning, one would think, that funny story about how you met the groom, that touching recounting of that magical moment when he proposed marriage, the expected report (well, at least it will be expected by your mom and the groom’s mother) about how many children you plan to have, etc. There is a time and place within every bride wedding speech for each of these and additional points; that is why a solid wedding speech example will help you form the core and structure of your special oratory. In addition, once you read a solid, cohesive and eloquently composed speech example, you will feel inspired to tell your own story; to conjure a speech that is far better than you originally imagined. Just as successful novelists first read the works of others before crafting their own books, thus inspiring and honing their talents, so orators must literally heed the words of others before writing their own speeches. Then comes the question of just how one should deliver a bride speech; and ultimately the answer to that question is bound to lie with you, the bride. Yet it is generally advisable to remain as calm and composed as possible throughout the course of your speaking session, while still addressing guests in a manner that is both personal and meaningful. 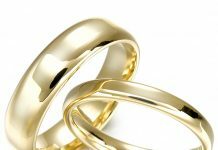 Listeners will expect you to shed a few tears and have a few giggles on the day of your wedding; the last thing they will want to hear is a dry, monotone reading of words that include overjoyed, the bonds of holy matrimony, my beloved husband, etc. Preparation, not petrification, is clearly the order of the day.You want to sound both natural and eloquent, loving and strong, hopeful and sentimental. All of these and other emotions are expected in the context of a wedding speech; an oratory that captures both sweet memories of a grand courtship and fond wishes for the marriage of a lifetime. If you need additional help and suggestions regarding how to conceptualize, plan, prepare and deliver the ultimate bride speech, please visit http://www.bestbridespeeches.com. This is your speech, your moment and your day; make it better and more beautiful than you ever imagined.